Understanding Welsh Place Names (ISBN: 9780955355745) | Map Stop | Top maps at a reasonable price in one place. What they mean and how to say them Puzzled by Welsh place names - but want to know what they mean and how to say them? Look no further. This is an exciting full colour pocket guide, Understanding Welsh Place Names: What They Mean and How to Say Them, from outdoor specialists Northern Eye Books. This innovative yet carefully thought out guide means non-Welsh speakers can now easily translate and understand place names all over Wales - on the map, on road signs, and out in the countryside. 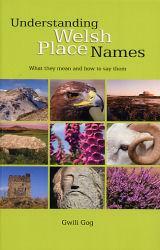 Written by native Welsh speaker, Gwili Gog, the book contains not only a comprehensive gazetteer of place names arranged county by modern county - with an authoritative explanation of what each name means - but also a potted history of the Welsh language, a quick look at pronunciation, and a photographic exploration of place names in the landscape, as well as key words accompanied by phonetic explanations of how to pronounce them. Wales will never be quite the same again.